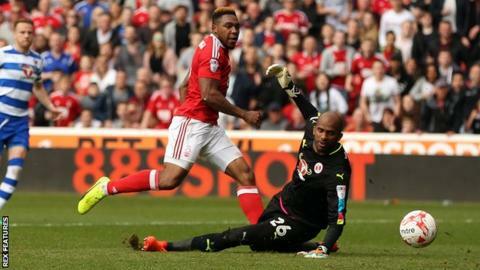 Britt Assombalonga boosted Nottingham Forest's survival hopes with two goals against a Reading side whose ambitions for automatic promotion were all but ended at the City Ground. Assombalonga put Forest up with a flicked finish past Ali Al-Habsi after being set free on goal by Ben Brereton. Mustapha Carayol's low finish made it 3-0 after Assombalonga headed a second. Two Yann Kermorgant goals for Reading were not enough as Forest moved three points clear of the relegation places. Victory over the third-placed Royals, who will have their top-two hopes ended if Newcastle avoid defeat against Preston on Monday, was Forest's first since also denting Huddersfield's promotion aspirations with victory in early April. Two defeats in four days over the Easter weekend - including a loss at relegation rivals Blackburn - left Mark Warburton's side in serious danger of the drop. A sense of anxiousness among home fans around the City Ground before kick-off was replaced by applause at half-time, after 45 minutes in which they threatened numerous times and restricted Jaap Stam's Royals to a solitary effort on goal. Mustapha Carayol was the hosts' chief protagonist of the first half and richly deserved his goal after the break, turning in the box before finishing with a low shot. Kermorgant's header from Jordan Obita's cross pulled one back to give Reading new impetus and his second goal, pouncing on a loose ball in the area, made for a dramatic finish but ultimately was not enough to rescue a point. Nottingham Forest boss Mark Warburton: "We just told them what we had to do. Our desire to remain a Championship club had to be greater than their desire to win promotion. It was as simple as that. Every one-v-one, every challenge, try to win it. "Have quality in your passing, look to penetrate - there is no lack of desire in that dressing room but we have let ourselves down as a group at times. Against Derby, Preston and Huddersfield, we have shown some really good quality but not always got the right results. "In Cardiff we deserved to get points out of the game and we did not. That is the nature of football. But today we deserved our victory - and we got it." Reading head coach Jaap Stam: "We have it in our own hands still. It is still down to us, but it will be a difficult game against Wigan, because they need a result as well. "It is not going to be easy, they are not going to hand it to us. We need to have the courage to do what we do. Forest are a good team, they have good players and they are fighting for their lives. But we need to be better than this. We knew the opposition we would face, because we had spoken about it prior to kick-off. "We spoke about what we needed to do at half-time. But straight away, they got that second goal and then the third. We did well to score twice to get back into it. We felt there was enough time to get the equaliser but we stopped being patient on the ball; we stopped trying to take control of the game." Match ends, Nottingham Forest 3, Reading 2. Second Half ends, Nottingham Forest 3, Reading 2. Jamie Ward (Nottingham Forest) is shown the yellow card. Attempt saved. Matthew Cash (Nottingham Forest) right footed shot from the centre of the box is saved in the centre of the goal. Assisted by Ben Osborn. Offside, Nottingham Forest. Eric Lichaj tries a through ball, but Britt Assombalonga is caught offside. Britt Assombalonga (Nottingham Forest) wins a free kick in the defensive half. Attempt blocked. Lewis Grabban (Reading) right footed shot from outside the box is blocked. Assisted by Chris Gunter. Foul by Joseph Mendes (Reading). Attempt blocked. Britt Assombalonga (Nottingham Forest) left footed shot from the right side of the box is blocked. Assisted by Jamie Ward. Substitution, Reading. Joseph Mendes replaces John Swift. Substitution, Nottingham Forest. Matthew Cash replaces Mustapha Carayol. Attempt missed. John Swift (Reading) right footed shot from outside the box misses to the left. Assisted by Yann Kermorgant. Substitution, Nottingham Forest. Daniel Pinillos replaces Daniel Fox because of an injury. Goal! Nottingham Forest 3, Reading 2. Yann Kermorgant (Reading) left footed shot from the centre of the box to the bottom left corner. Attempt missed. Yann Kermorgant (Reading) header from the centre of the box misses to the right. Assisted by Roy Beerens with a cross. Attempt missed. Roy Beerens (Reading) right footed shot from outside the box misses to the right following a corner. Attempt missed. Ben Brereton (Nottingham Forest) header from the left side of the box is close, but misses to the left. Assisted by Ben Osborn with a cross following a corner. Corner, Nottingham Forest. Conceded by Yann Kermorgant. Corner, Nottingham Forest. Conceded by Chris Gunter. Corner, Nottingham Forest. Conceded by Jordan Obita. Attempt blocked. Joe Worrall (Nottingham Forest) left footed shot from very close range is blocked. Attempt saved. Ben Osborn (Nottingham Forest) left footed shot from long range on the right is saved in the centre of the goal. Foul by George Evans (Reading). Chris Cohen (Nottingham Forest) wins a free kick on the right wing.